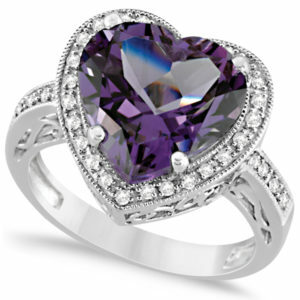 Heart-shaped amethyst and diamond ring halo in 14k white gold 5.41 ct by Allurez. Valentine’s Day is around the corner and we’ll here to help making your shopping experience easier with some jewelry and gift ideas. If you’re looking to give your loved one a truly romantic gift for Valentine’s Day, then definitely consider jewelry. There’s so much variety and versatility available so you’re bound to find the perfect piece that suits her style, or whoever it is that you’re shopping for, whether it be a best friend of even for yourself! 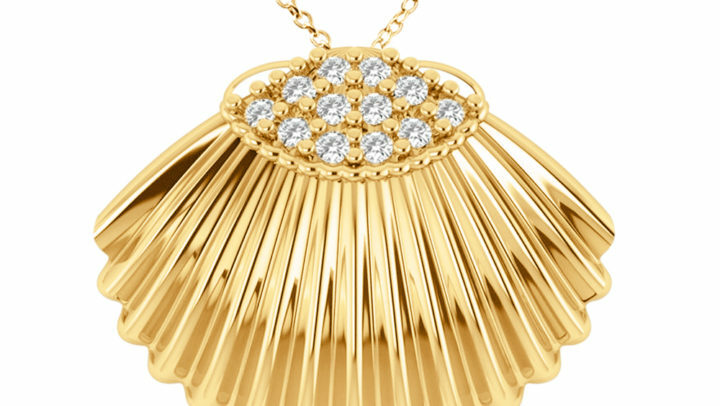 Jewelry may be just as cliché as chocolates and flowers as something to give on Valentine’s Day, but its sentiment lasts long after February 14. It can sometimes be tough trying to figure out what to get your partner for Valentine’s Day. There are so much different choices out there — bracelets, necklaces, earrings, and rings — so we’ve listed a few of our favorites for you to consider. Heart-shaped rings are the perfect women’s ring to gift your Valentine in our opinion. 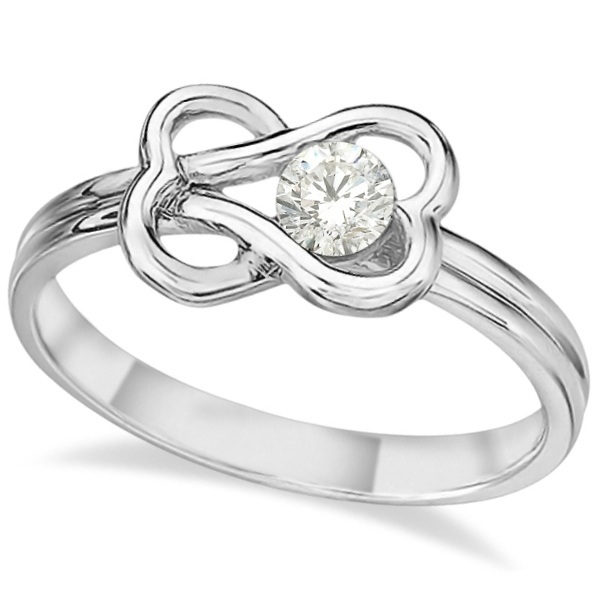 Really anything heart-shaped will send the message of love, but heart-shaped rings are one of our favorites. You can choose between sterling silver, diamond, or precious stone in the shape of a heart but don’t forget that sizing and style are both important, so determine her ring size and find a design that she will love wearing for years to come. Eternity interlocking hearts diamond ring in 14K rose gold by Allurez. A beautiful pair of drop earrings can also make for a great gift and they are a perfect piece of jewelry that can transition from day to night. If your Valentine prefers more subtle and simple jewelry, then find a pair that is not too long and with not too many stones or sparkles. Sometimes the less, the better. And for those who like more show-stopping pieces, choose dangling earrings that feature sparkle, are long and draw attention with vibrant colors. 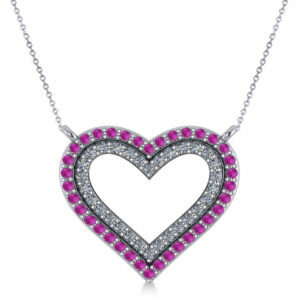 Heart-shaped necklaces come in various styles determined by metal, stone, and setting. Some common designs include, but are not limited to, pendants and chains, and they decide between different lengths, like a choker or an extra-long opera. For sometime a bit different, you can go for a heart key necklace, a heart-shaped locket, a black diamond heart pendant or, as an expressive of your everlasting love, an infinity heart diamond necklace. 0.33CT 14K white gold diamond hearts pendant necklace by Allurez. Nothing says you love someone better than, well, a piece of jewelry that says “Love” ! 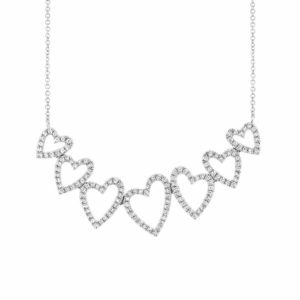 A love necklace says it all and when you add diamonds, you can’t go wrong. 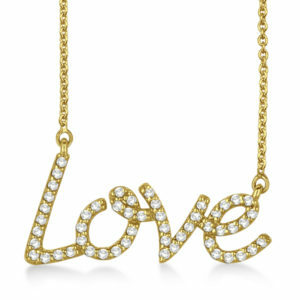 “LOVE” diamond pendant necklace in 14k yellow gold (0.50CT) by Allurez. 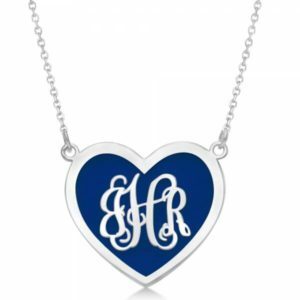 For a personalized touch, get that special someone (or even if it’s yourself) a piece of jewelry with you initials on it, whether it be a necklace, bracelet, ring or earrings. Enameled heart monogram initial pendant necklace in sterling silver by Allurez. A diamond tennis bracelet is a special piece of women’s jewelry and a special Valentine’s Day present that shows you really care about someone. They don’t always have to be a splurge and the color of the setting metal can range from yellow gold to platinum. Diamonds with a slight yellow or beige tint match perfectly with a yellow or rose gold setting, according to experts. If she’s not so into diamonds and gemstones, then pearls are definitely the way to go. They symbolize innocence and purity and be either dressed up or dressed down. Some gift ideas include a strand of pearls to wear as a necklace, freshwater pearl earrings or a pearl ring in a classic or unique setting. There are so many options when it comes to pearls, and you can even mix and match it with diamonds and other gemstones. 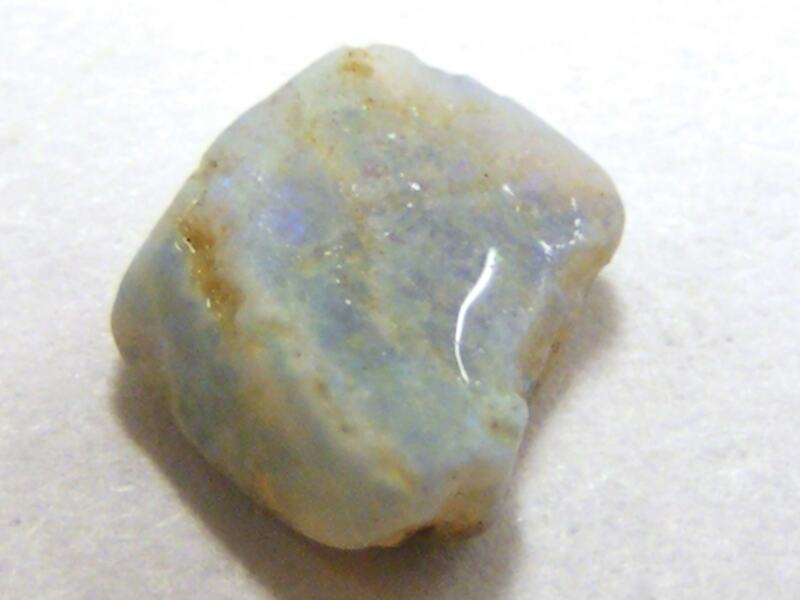 This natural jewel also comes in a variety of colors and shapes to choose from. 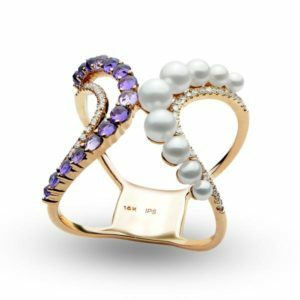 A pearl, diamond and amethyst double bar ring in 14k gold 0.71CT by Allurez. This gift is perfect if you or the person you’re gifting is someone who love color, and you have so many gemstones to choose from, including blue sapphires, pink sapphires, emerald, rhodolite, and amethyst. 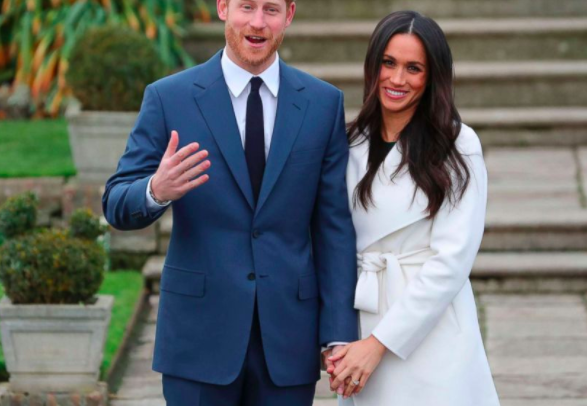 Valentine’s Day is in fact one of the most popular days to propose so if that’s something you’re considering, then look for engagement rings and see what size, metal, and setting suits her style best. 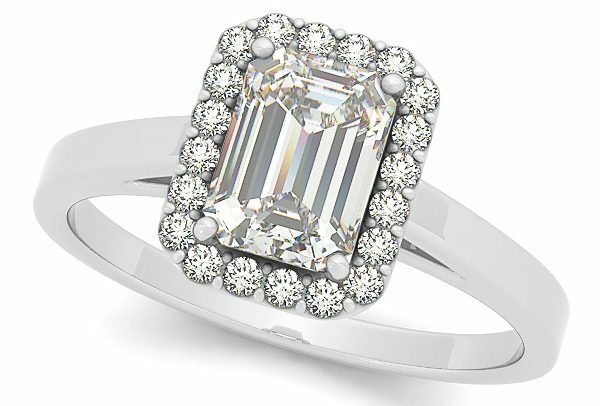 Go traditional with a round diamond ring or unique with a marquise ring. Show your Valentine that you know and appreciate all that she is with a piece of birthstone jewelry. 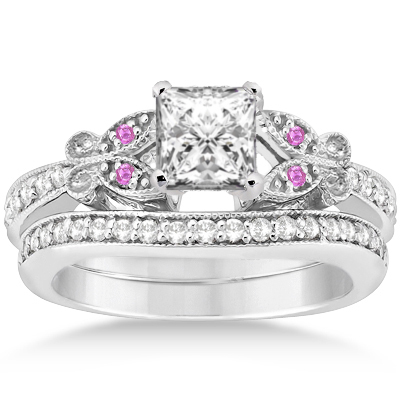 You can showcase her birth month in a variety of ways, including a beautiful set of ruby earrings, an amethyst necklace, or an emerald tennis bracelet. 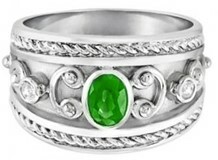 Another idea is to find a piece of jewelry that features her birthstone as well as her favorite colors. Getting it right shows that you know her well. 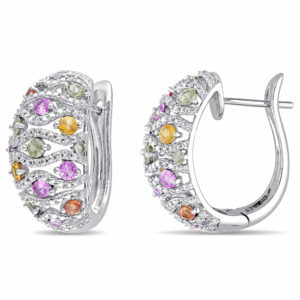 Multicolored sapphire and diamond hoop earrings in 14k white gold (2.59CT)by Allurez. Pink and red are the universal colors of Valentine’s Day, so anything in one of those colors (or both) is a great gift for Valentine’s Day. Even rose gold is a good choice, like a rose gold bangle or set or earrings. You can also pair your jewelry gift with red roses, which symbolize passion and deep love, or pink ones. Light pink roses symbolize admiration, gentleness, and can be used to bring messages of sympathy, and fuchsia-toned roses can mean appreciation and gratitude and are traditionally used to express thanks. A double open heart diamond and pink sapphire pendant in 14k white gold (0.66CT) by Allurez.